At first I thought he was joking - anyone who's ever had to move a piano will know that they are HEAVY - half a ton kind of heavy. This is because of the frames inside the piano, which are usually either iron or steel. Andrew informed me that he's previously put a 4-seater Chesterfield sofa up a tree at a music festival for a musician to perform from. As you do. He thought that a piano, whilst perhaps a bit tricker, would be achievable. So when it became clear that Andrew was serious, I decided that this was an opportunity that was too good to pass up and we started to plan. The first thing to do was to get a piano - ideally one that was on the lighter side. I was aware that you can get what's often referred to as a 'mini piano' - a very small piano, originally designed to fit in small houses in Edwardian times when a piano was very much a thing to have in in your parlour. They're much lighter and shorter than normal pianos as they tend to be missing an octave. I started hunting for one on Ebay and, as luck would have it, found a lovely little one about half an hour away (made by Collard and Collard), which was going for a 'buy it now' price of 0.99p. Bargain! 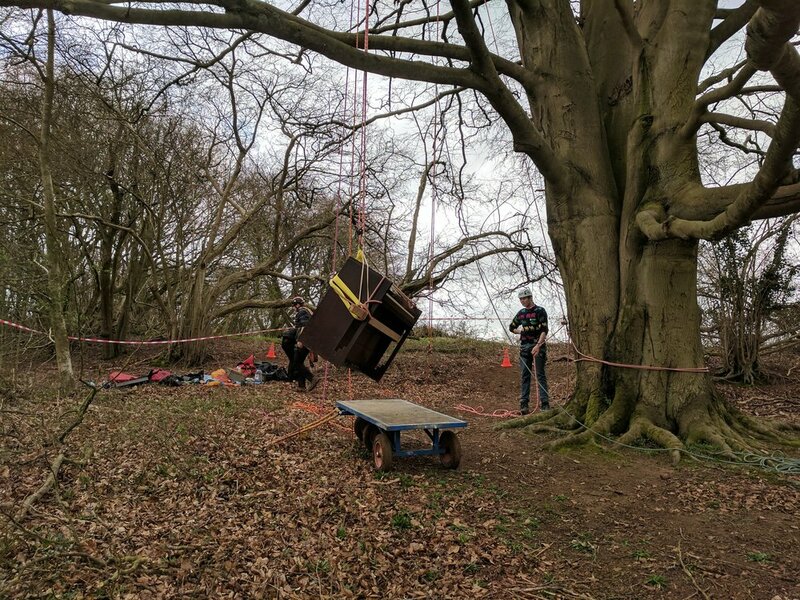 So, with piano purchased and Andrew and his team of tree climbers having built a platform for the piano to sit on in the tree and a worked out a complicated system of ropes, pulleys and general hoisting sophistication, the day of filming had arrived. We started on Friday night, giving Andrew a chance to test the rigging system in his back garden and also check the platform that the platform was going to be big enough for the piano. As you might notice from the picture below, all of this was done in the dark, making head torches a necessity! The next morning we set off about 8am. Andrew had very wisely borrowed a very hefty trolley from a friend which, with much difficulty we eventually got the piano and all of the climbing and rigging gear onto. We were going to be using a beech tree (nicknamed 'Beechy') in Shotover Woods that Andrew had climbed several times before. He had removed all the deadwood, and assured me that it was perfectly safe - or at least as safe as putting a piano up a tree can possibly be. After a tricky journey with the trolley to the site of the tree, Andrew and his team set to work. Their plan was to set up the wooden platform in the tree, which the piano would then be hoisted onto and secured. When he showed me the branch that they were going to be using, the reality of what we were doing did start to hit home a little. It was ten metres up, and it was a very windy day. I've never been that bothered about heights but I was aware that what we were doing could, in theory, be very dangerous if something went wrong. However I needn't have worried - Andrew was very safety conscious, making sure that everyone was wearing helmets at all times, and clearing an exclusion zone to ensure that no interested members of the public might wander over and put themselves at risk. In Andrew's own words, "the worst that can happen if that piano comes down, is that it makes a bloody big hole in the ground". After lots of hoisting, securing, tightening and testing, the piano was finally up, and the time had come for me to go and play it. They had rigged a kind of seat out of my old suitcase for me to sit on and the idea was that I would wear two harnesses; one underneath my dungarees and one over the top. I would then climb up to the piano, remove the outside harness and transfer the rope to the one underneath. In theory, aside from the single safety line, it would look as though I'd just casually shinnied up the tree and started tinkling the ivories. Climbing up was hard work. Unlike rock climbing, you don't climb from foothold to hand hold, but rather hoist yourself up on the rope whilst you dangle merrily in mid air. It's all about upper body strength, which is not something I've got much of. Ten metres might not sound like a lot, but when you're up there it feels HIGH. Also the act of taking your harness off (even when you know you have another one underneath your trousers) feels just plain wrong. Like jumping off a cliff with only a wingsuit. I'd been so focused on getting up there that I hadn't really thought about how I would actually have to play the piano and sing along to the track whilst ten metres up on a very windy day. Andrew and his friend Luca were both filming on ropes of their own and got to work as soon as the piano was up to try and limit the time we all had to spend up the tree getting cold. One thing I hadn't considered is that when you're high up on ropes there's nowhere to put anything. Simple things, like where to put your phone, your coat or a spare battery for the camera, suddenly became a lot more complicated. In total we spent about an hour up there doing different takes from every angle we could think of. 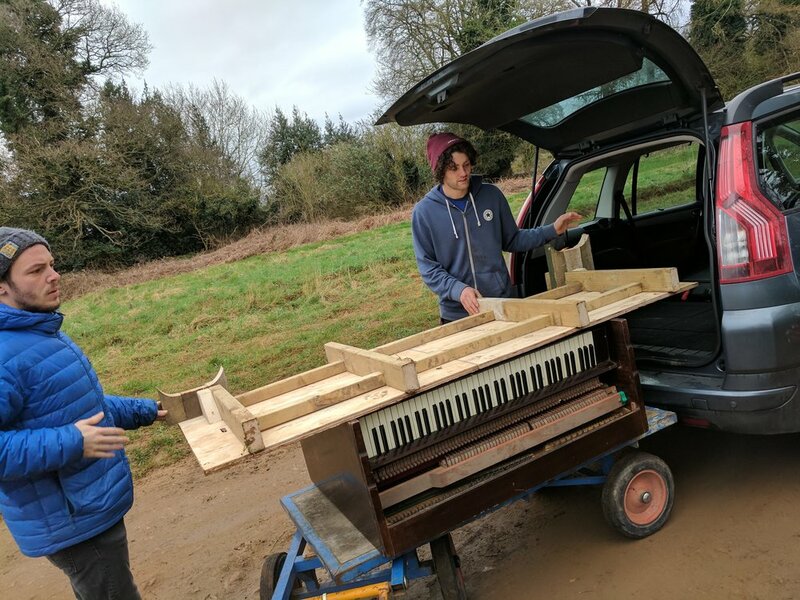 We were very aware of the fact that this was a one time chance - we weren't going to be putting a piano up a tree again anytime soon! Coming down was very surreal, like stepping on to land after a week at sea. I've never been so glad to be on the ground! It was quite sad to see the piano coming down - we did talk about leaving it there for the fun of it, but there was too much of a chance that it might come down on some poor unexpecting dog walker on a windy day. So there we have it. A thoroughly exhausting, exciting, weird, wonderful, cold, and occasionally boring, day. The video is now edited and will be up soon so do keep a look out. Huuuuuuge thanks to Andrew and his team for pulling of the unnecessary and ridiculous feat of putting a piano up a tree.